Business revolution? 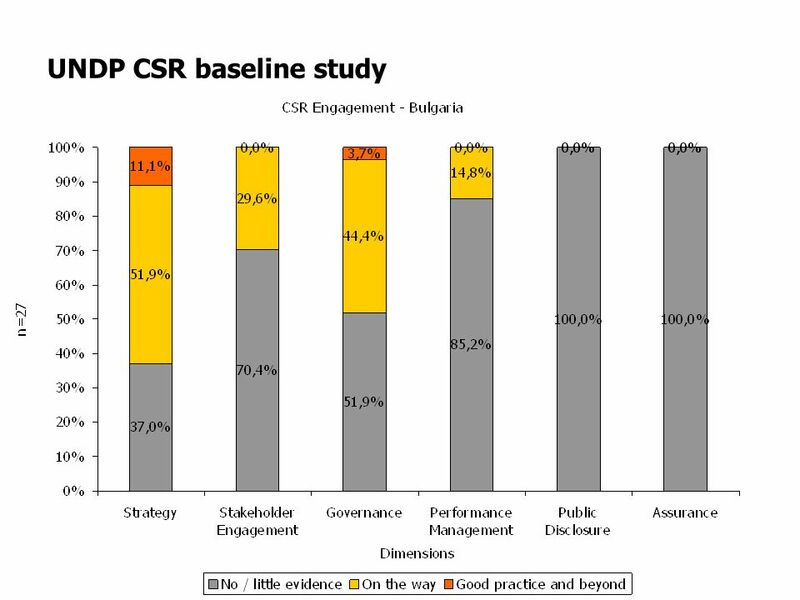 Challenges and opportunities of CSR management Róbert Braun, Ph.D. 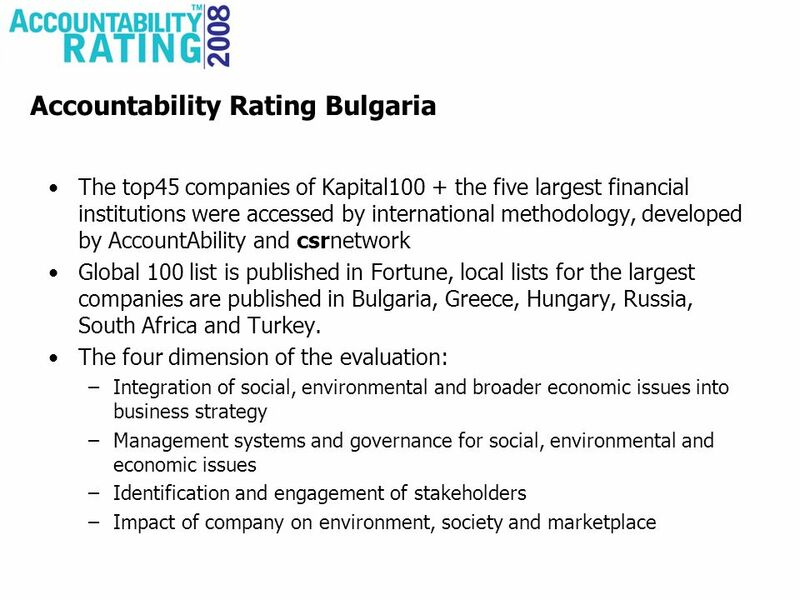 Managing Director Braun & Partners Bulgaria 30 October 2008. 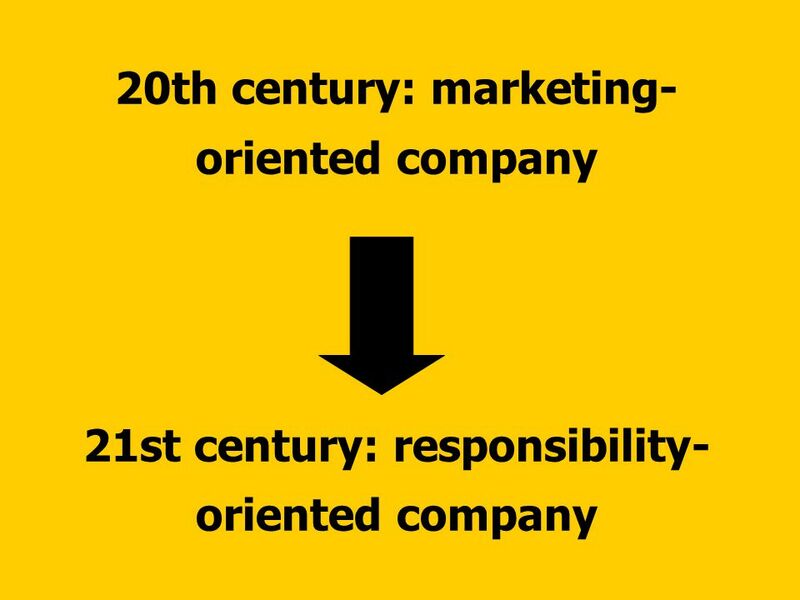 2 The biggest business challenge of the 21st century: integrating social values of stakeholders into business operations. 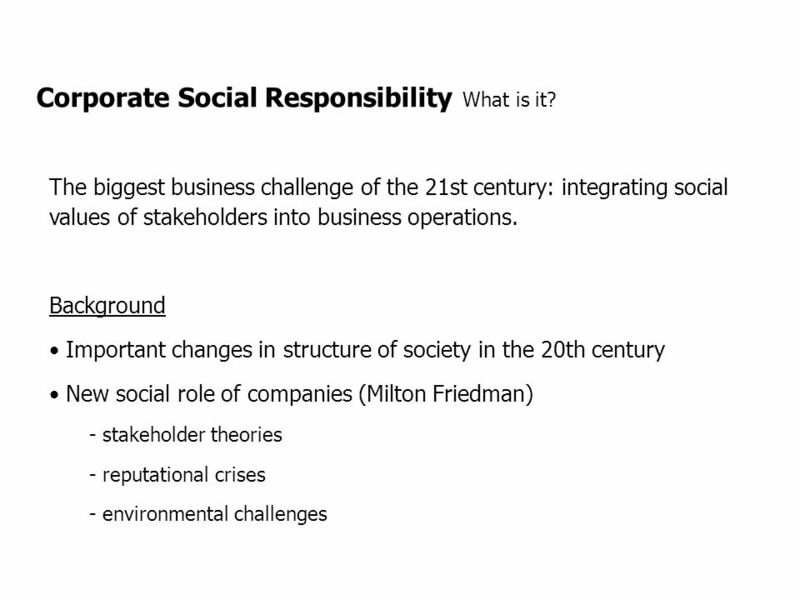 Background Important changes in structure of society in the 20th century New social role of companies (Milton Friedman) - stakeholder theories - reputational crises - environmental challenges Corporate Social Responsibility What is it? 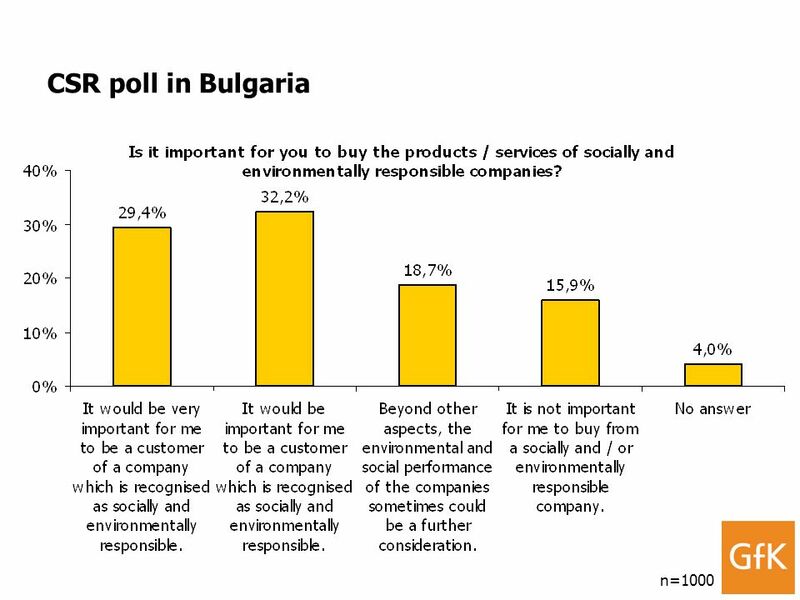 5 CSR poll – international results n=3000 Companies do not only have to care about their shareholders/owners but also have to consider the interests of their other stakeholders, such as employees, local communities, customers, civil organizations, and the environment. 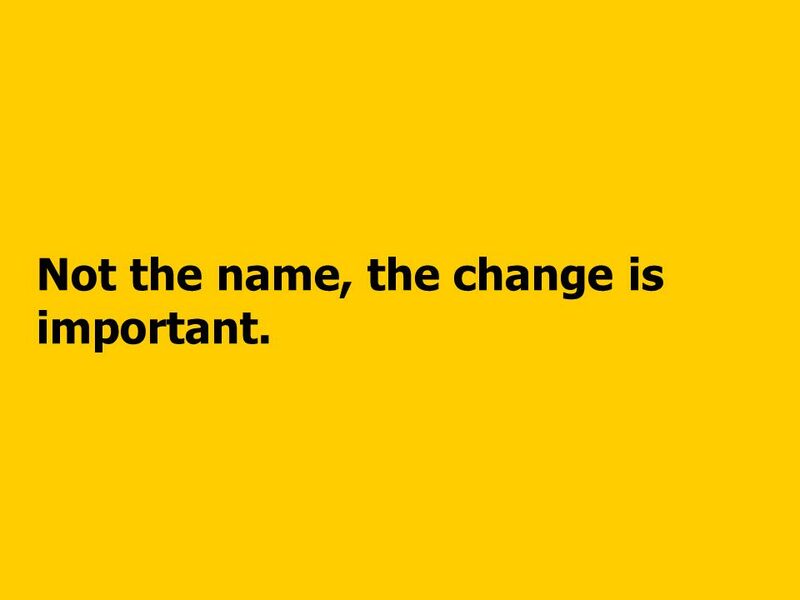 11 Not the name, the change is important. Download ppt "Business revolution? Challenges and opportunities of CSR management Róbert Braun, Ph.D. 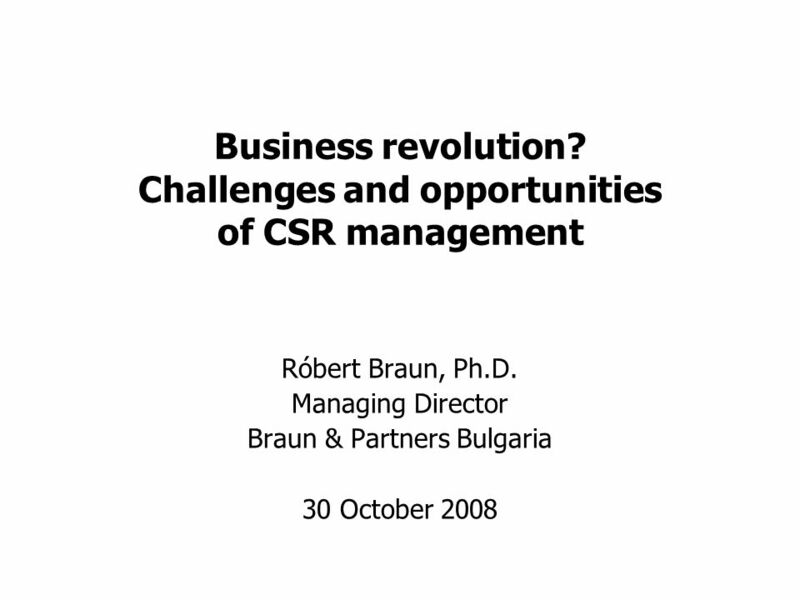 Managing Director Braun & Partners Bulgaria 30 October 2008." Importance and Implementation.  New Company Review  New Strategy  New Goals  New Markets. 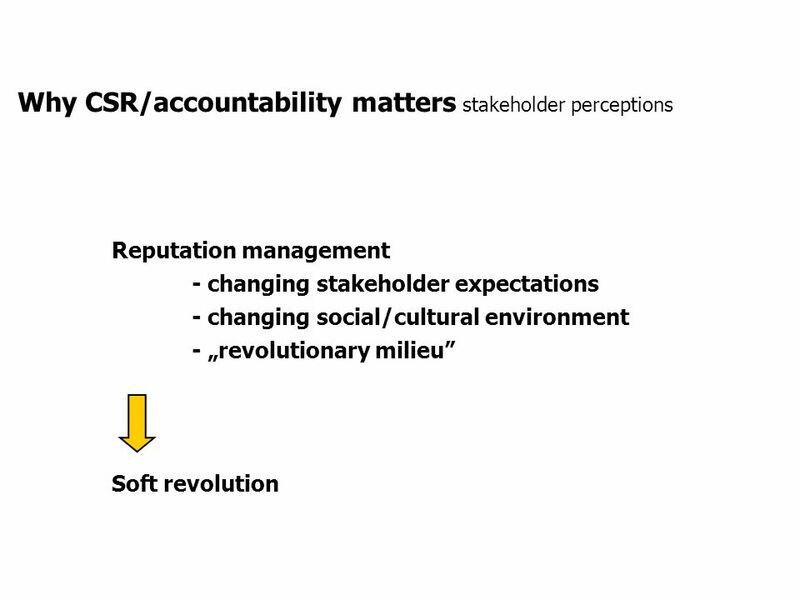 Peer Reviews and new Compendium on CSR Presentation to HLG meeting 20 December 2013, Brussels. 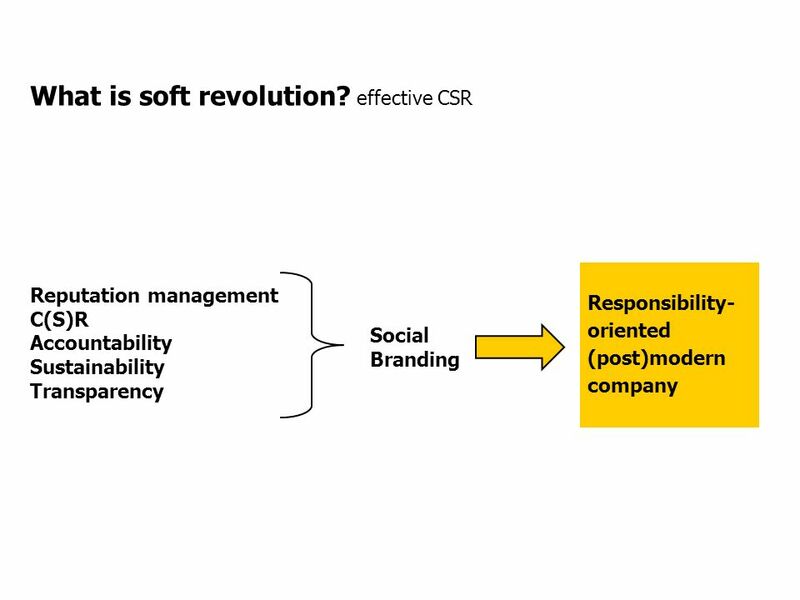 THE VALUE OF CSR TO CORPORATE ORG. & BENEFICIARIES Osayi Alile Oruene Executive Director FATE FOUNDATION LTD/GTE, LAGOS. INTERNATIONALISATION - what does it mean?. Internationalisation around the world Qualifications convergence Internationalising the curriculum Student. 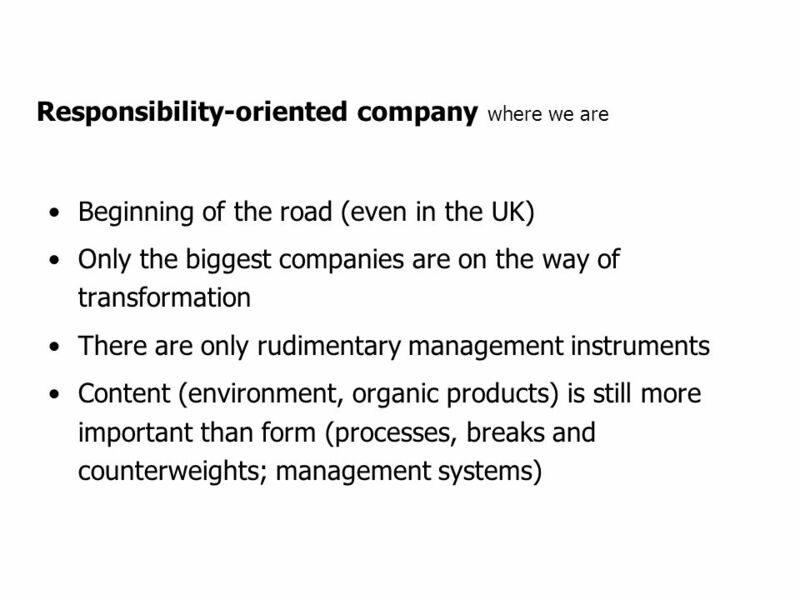 Slack, Chambers and Johnston, Operations Management 5 th Edition © Nigel Slack, Stuart Chambers, and Robert Johnston 2007 The operations challenge Chapter. ENGINEERING COUNCIL OF SOUTH AFRICA Strategic Plan October 2014. Facilitated by Goldengate Consulting July Introduction Corporate Social Responsibility. 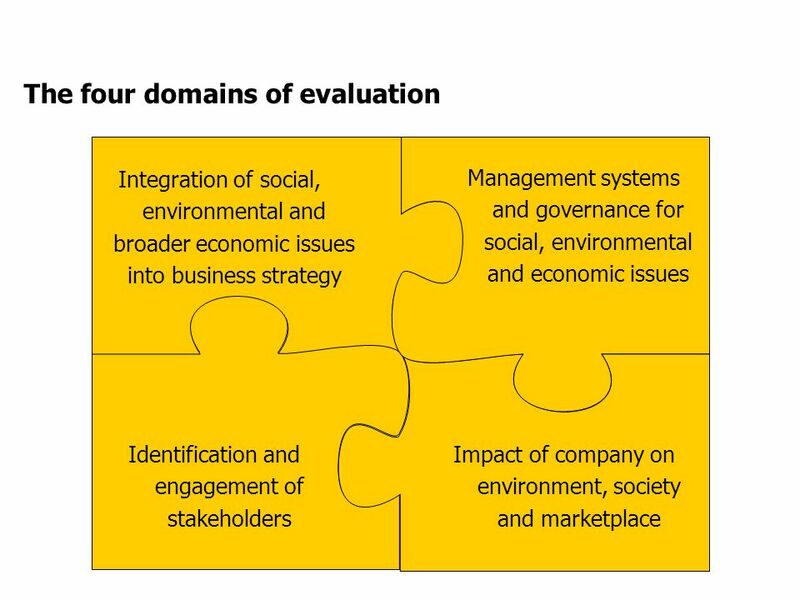 TRANSFORMING CAPABILITY SUPPORT MATERIALS LEADING VISION CREATION Triple Bottom Line Introduction The triple bottom line is synonymous with sustainability.  As the music industry changed so did her approach  Ticket sales > CDs  Recognized opportunities in social media  Creative production team “Haus of. 1. Presented by Name of Ambassador European CSR Award Scheme 2012/ NAP Logo Implemented in by. C H A P T E R 2 Stakeholder Relationships, Social Responsibility, and Corporate Governance. Social Responsibility: Training Students and Working with Business in Russia ISO General Assembly Open Session on Education Tatiana Guseva D. Mendeleyev. The Importance of CSR in Saudi Arabia May 29, 2012. Management of Social, Ethics and Transformation in Afrox July 2013. 1. 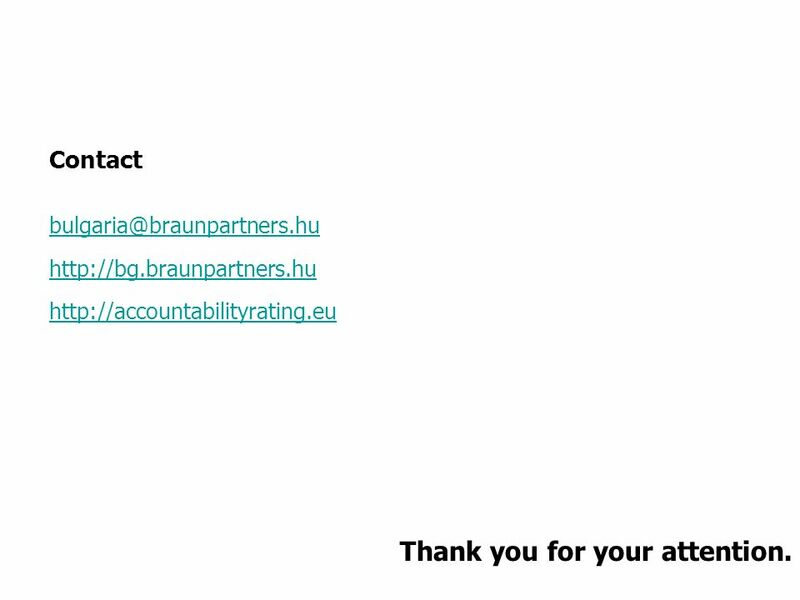 Presented by Name of Ambassador European CSR Award Scheme 2012/2013 2 NAP Logo Implemented in by.